This page has been developed by ILDA and Laser Compliance, Inc. to help exhibitors at the LDI trade show. LDI’s 10-page Laser Safety Requirements are here. This page exists to give additional information and links. Information on this page is up-to-date as of July 5, 2017. Information elsewhere on this ILDA website, or at other websites, may conflict with the information on this page. However, LDI EXHIBITORS SHOULD REFER PRIMARILY TO THE INFORMATION ON THIS PAGE because it is the most up-to-date and relevant for LDI exhibitors. Links to the various FDA forms are in the text and also at the bottom of the page. Laser products manufactured or imported into the U.S. are regulated at the federal level by the Food and Drug Administration (FDA) Center for Devices and Radiological Health (CDRH). The term “laser product” can refer to both the laser device/projector (hardware), and a laser display/show (how the hardware is used). FDA has detailed information about their requirements here. The summary below lists the most important points as they relate to a trade show such as LDI, and to laser light show devices/projectors and displays/shows. The information is NOT necessarily valid for medical, surveying, industrial, or some other laser types. Lasers and laser products which will be exhibited in a functioning manner (i.e., they will be powered on) must be certified as per FDA requirements. Class 3B and 4 laser display devices/projectors also must be varianced. 1. The manufacturer self-certifies that the laser product meets FDA requirements; particularly those described in 21 CFR 1002, 21 CFR 1010, 21 CFR 1040.10 & 21 CFR 1040.11, and/or FDA Laser Notice 50. Additional information is available in FDA Publication 86-8260, “Compliance Guide for Laser Products.” The manufacturer can “self-certify”; they do NOT need to use a third party such as Underwriters Laboratories. 1. Follow step 1 above. 2. Follow step 2 above but do NOT follow step 3. 3. A “variance” is also required. (This gives “permission to vary” from FDA’s requirement that only Class 1, 2 or 3R (IIIa) lasers be used for laser displays or shows.) All Class 3B or Class 4 laser devices/projectors intended for use in laser displays or shows must be manufactured and certified under the conditions of an approved FDA variance. 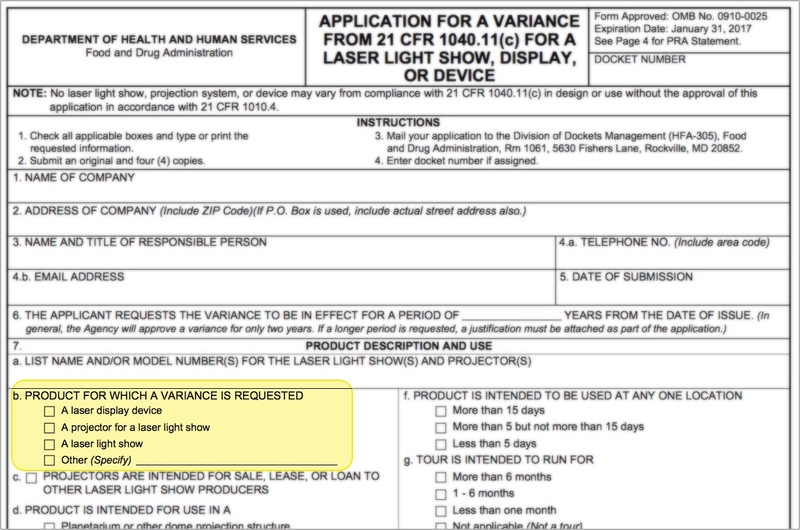 Apply for the variance using FDA Form 3147, “Application for a Variance from 21 CFR 1040.11(c) for a Laser Light Show, Display, or Device”, and submit this at the same time as the laser product report in step 2 above. 4. FDA will review the documents. If FDA is satisfied, they will send a variance approval letter to the manufacturer. This letter specifies the certification label’s verbatim text. The certification label shall be affixed onto the laser device/projector. Laser displays and shows are also “demonstration laser products” under FDA regulations. Displays/shows using Class 1, 2 and 3R do not require a variance. Displays/shows using Class 3B and Class 4 laser devices/projectors must be presented only under the conditions of an approved FDA variance. Fill out FDA Form 3640, “Reporting Guide for Laser Light Shows and Displays”, and fill out an application for a variance using FDA Form 3147. Submit both to FDA. The product in item 7b can be laser hardware (items 1 and 2), it can be a show using lasers (item 3) , or “other” (item 4). For a laser hardware manufacturer who also will be doing displays/shows, multiple boxes can be checked; for example, items 2 and 3. Note that LDI is additionally requiring that non-certified laser products must be disabled so they cannot be activated at the trade show. Certified laser products — those that have received an Accession Number from FDA — may be imported under Declaration B1 (complies with performance standards and has Accession Number). Non-certified laser products imported into the U.S. under Declaration C2 in the form (temporary import bond for a trade show/demonstration) are allowed entry under the conditions of a bond. This is necessary to ensure they are not operated, and that they are promptly re-exported. Some U.S. states and localities have their own lasershow-related requirements. As an exhibitor, you need to meet any requirements for the state, county and city where the LDI trade show is located. IMPORTANT: The information below applies to laser products used for laser displays and shows. Specifically, it applies to “demonstration laser products” as defined in 21 CFR 1040.11(b)(13). The information also concentrates on exhibiting such laser products at a trade show, such as LDI. While much of the information may also apply to other laser products — general purpose lasers, industrial, research, medical, surveying, etc. — some of these products may have fewer, different or more requirements. So use the information below only as a guide to laser display equipment and shows. The information is presented to the best of ILDA and the authors’ knowledge. We are not responsible if information changes, or if FDA policy differs from what is listed here. The following is a quick review of the major Classes (not including 1M and 2M). Some additional details about Classes are here and here. Classes can be referred to by the old style Roman numerals I, II, IIIa, IIIb, and IV which are often found in FDA documents. We are using the newer style IEC Arabic numerals 1, 2, 3R, 3B and 4. Note that FDA IIIa is essentially the same as IEC 3R. After each Class, we have listed the power levels for the kind of lasers typically used in laser display devices and projectors: small source, continuous wave (CW) lasers emitting small diameter, collimated visible beams. If you have some other type of laser product – for example, a laser with a non-visible beam, with a highly divergent beam, or with a pulsed beam -- consult a laser safety expert to determine the proper Class. Class 1: Not considered hazardous. For typical display devices/projectors, 0 – 0.39 milliwatts (mW). No variance or other special requirements for displays/shows. Class 2: Not considered hazardous for momentary viewing. Do not stare into beam. For typical display devices/projectors, 0.4 – 0.99 mW. No variance required for display/shows; however, do not use where persons could stare into, or have prolonged exposure into the eye. Class 3R (FDA Class IIIa): Exceeds the exposure limits for momentary viewing, but is considered low risk. Avoid direct eye exposure. For typical display devices/projectors, 1 – 4.99 mW. No variance required for displays/shows. Can be used unattended if aimed into an area where a person’s eyes would normally not be expected to be located (such as behind a table or barrier). Can have laser light on persons if 1) the light is below the applicable Maximum Permissible Exposure and 2) the laser usage is continuously monitored. When used for a laser display or show, Class 3B and 4 devices must be varianced to FDA. See the section “Obtaining a variance” (below) for details. Class 3B: Can be hazardous when directly viewed by the eye. Avoid exposure to beam. For typical display devices/projectors, 5 – 499.9 mW. Class 4: Can be hazardous to the eye from viewing direct or scattered light. Can be hazardous to skin. Avoid eye or skin exposure. Can be a fire hazard. Avoid exposing surfaces which could smolder or burn. For typical display devices/projectors, 500 mW and above. The Maximum Permissible Exposure (MPE) is the greatest amount of laser light that is permitted, under specified conditions. Said another way, it is the power or energy density that is not expected to cause damage to a specified structure (eye or skin), given a specified time of exposure. Lasers used in displays and shows usually have similar characteristics: a small source, continuous wave (CW) emission, visible light, and small diameter beams that are collimated or weakly divergent. For such lasers, the eye exposure MPE that is most commonly used is for unintended (inadvertent, accidental, unwanted) exposures of less than 0.25 second. Laser safety regulations are based on a person exposed to bright light who turns away, blinks or takes other aversion action within 1/4 second. For the CW laser type specified above, and an exposure of less than 1/4 second, the eye exposure MPE is 2.54 milliwatts per square centimeter. At the LDI trade show, lasers with accessible beams or effects will not be allowed over this MPE. The 2.54 mW/cm² is for a static (non-moving) beam, where the aversion response limits the time exposed to the beam. The MPE allowed for audience scanning can be different. For example, in the U.K. and some European countries, a peak irradiance of 1 mW/cm² is mandated. This more conservative limit is based on possible beam overlaps, and exposures longer than 0.25 seconds. In the U.S., variances for FDA-approved audience scanning should state the maximum permitted MPE. FDA regulates laser products (hardware containing lasers). They also regulate three laser uses: Demonstration, Medical, and Surveying/Leveling/Alignment. This FDA definition means that merely demonstrating a laser product at a trade show does not necessarily turn the product into a “demonstration laser product”. For example, a manufacturer of a general purpose laser product could (safely!) demonstrate the laser emitting a beam. One way this could be done is by enclosing the beam in a clear plastic tube, thus preventing human access. Class 3B and 4 demonstration laser products are required by FDA to have an approved variance for the product (the device/projector) and an approved variance for the display/show (how it is used), prior to any public use such as exhibiting at LDI. These may be separate variances, or a single variance obtained by a manufacturer to cover both their device/projector and how it is displayed/showed. However, if this laser is used for a “demonstration, entertainment, advertising display or artistic composition” as defined by FDA then it becomes a “demonstration laser product.” Because demonstration laser products are limited to Class 3R, using this higher-powered Class 4 laser for a show would require the user to apply for, and receive, a variance (FDA Form 3147) permitting use as a laser show device. FDA Laser Notice 51, “Responsibilities of Laser Light Show Projector Manufacturers, Dealers, and Distributors” requires anyone who is “introducing into commerce” a laser projector that is Class 3B or Class 4 (e.g., above 5 mW output), to have an approved variance from the FDA. Further, they cannot purchase the laser projector before the variance is approved. The short version of “introduction into commerce” means just about any use, except for use at home with family and friends. For example, a variance is required if there is some type of commercial transaction, such as exhibiting at a trade show, or a person paying to see a concert or to have drinks at a bar where a laser projector is being used. It can also mean that an advertiser is paying to support an event with free admission, or the laser is advertising a product, service or event that costs money. For any questionable “edge cases,” it may be advisable to obtain a variance anyway. This way, if authorities raise any questions, you have documentation that your use is permitted under federal law. Sometimes a manufacturer will want to publicly present a new laser product which is not yet in compliance with the U.S. Federal Laser Product Performance Standard (21 CFR 1010.2). Or the manufacturer has not yet had time to certify to FDA (using Form 3632) that the laser product is compliant. A manufacturer may publicly present a non-certified laser product, such as exhibiting at a trade show, if the product has a clearly visible label stating “This laser product sample is not yet certified to U.S. FDA safety standards and cannot be activated.” Of course, the laser product cannot be turned on or otherwise activated. This permission to exhibit only applies to a manufacturer. A dealer, distributor, end user or other non-manufacturer can NOT present a non-certified laser product. Note: In addition to the above labeling requirement, the LDI trade show also requires that non-certified laser products must be disabled so they cannot be activated at LDI. For example, a key could be removed from a keyswitch, or the power cord could be removed and stored. If you wish to import a non-certified laser product, there are a number of additional steps to take. On FDA Form 2877, “Declaration for Imported Electronic Products Subject to Radiation Control Standards” which is used to import all laser products, you would check Declaration C (“The products Do Not Comply With Performance Standards”) and C2 (“Trade Show/Demonstration”). The laser product will need to come into the U.S. under a temporary import bond, there must be a “Radiation Protection Plan”, and then after the trade show/demonstration the product must be destroyed or exported under U.S. Customs supervision. This process is so cumbersome that it is easier to certify the laser product to FDA using FDA Form 3632, the laser product report, and wait to receive an Accession Number from FDA (as described below). Then you can begin the process of importing into the U.S. On FDA Form 2877 you would check Declaration B (“The products Comply With the Performance Standards”) and list the Accession Number of your laser product report. Manufacturers of laser products built in the U.S. or imported to the U.S. must certify their products to be in compliance with U.S. Federal Laser Product Performance Standard (21 CFR 1010.2). This process of self-certification requires several steps and usually a few months to complete. Certification of laser products is required only in the United States. Therefore, laser products which are legal in other countries are not automatically legal in the US. The manufacturer can “self-certify”; they do NOT need to use a third party such as Underwriters Laboratories. After the CDRH has received the laser product report, it will be given an Accession Number, which is an FDA tracking number indicating receipt of the report. For imported products, an Accession Number is required for Customs clearance during importation of certified laser products into the U.S. (except for products imported under FDA Form 2877’s Declaration C2). Certification of laser products also requires follow-up annual reports using FDA Form 3636. These are required to keep certification current. Under FDA regulations, normally any laser above Class 3R (IIIa) would not be allowed to do a laser light show. But you can apply for a “variance”, or permission to vary from FDA regulations. The text below is taken from FDA Laser Notice 51, “Responsibilities of Laser Light Show Projector Manufacturers, Dealers, and Distributors”. Material in brackets and italics [like this] are clarifications and comments by ILDA. A ‘variance’ is a formal permit issued by the U.S. FDA to allow a specific manufacturer or show producer to ‘vary’ from the U.S. federal regulations. A variance is required for the manufacture of Class 3B or Class 4 laser projectors (aka, ‘manufacturer’s variance’). A variance is also required for the performance of a laser light show and/or laser effects, or sales/marketing demonstrations with a Class 3B or Class 4 laser projector or other laser effects device (aka, a ‘show producers variance’). A single variance can be granted for just manufacturing, or just show production, or for both. No variance is required for Class 1, 2, or 3R (IIIa) laser light show products, or for laser shows and effects created with these classes of lasers. The first step in getting a variance is to submit a variance application and the appropriate supporting documentation. Typically, at minimum, a laser product report and a sample show report must be submitted with the variance application when both a manufacturer’s variance and producer’s variance are required. Variances are not transferable. Begin the application process early, because the second step – FDA review and (hopefully) approval of new variance applications – can require several months. There is no government fee for the variance application or for the variance once approved. The variance requirement only applies to ‘demonstration laser products’. (*see legal definition below) This means Class 3B and Class 4 laser products laser display systems, laser light show projectors, video laser projection, laser effects systems. Other types of laser products (e.g., non-demonstration products), do not require a variance for manufacture or use. This may include industrial laser cutting or marking systems creating signage, gobos, etc. This would also include general purpose laser light sources (e.g., just a bare laser itself) being marketed to manufacturers. However, all laser products, no matter what the Class or purpose, must still be certified and operated safely, if they are to be powered on. 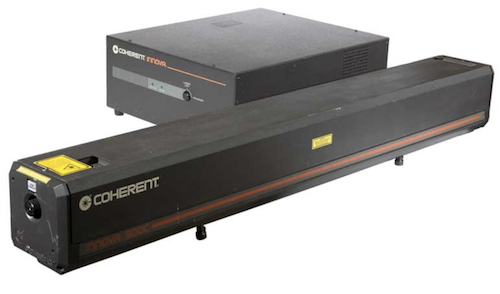 General purpose laser sources which are Class 3B or 4 must be operated per the terms of ANSI Z136.1, and cannot be configured into any kind of effect or projector. FDA and U.S. Customs control all laser products entering the United States. Laser products shipped to the U.S. without the proper laser paperwork will generally be seized by Customs. Carefully check all the details of your particular situation. There are several problems that can prevent the timely arrival and release of lasers when shipped to the United States. Customs regularly inspects laser shipments for the presence of required safety labeling, including the certification label. For any Class of laser being imported from outside the U.S., the importer must fill out FDA Form 2877, “Declaration for Imported Electronic Products Subject to Radiation Control Standards” and provide it to the customs broker or shipper at the time of U.S. importation. Also, place three copies on the outside of the shipment. This form provides data to FDA about the importation and compliance status of the laser product. The second page of Form 2877 contains instructions regarding its use. Form 2877 indicates to FDA and Customs the safety and legal status of the laser product. If the product has been certified and an Accession Number has been received from FDA, the FDA Accession Number is entered on this form allowing passage of the product into the U.S. If the product report has been filed more than one year earlier, the Accession Number provided back by FDA from the submission of the annual report is typically required by the FDA (on the 2877 form) to allow a certified laser product to enter the U.S. If the product has NOT been certified, it typically will enter under a temporary import bond (TIB) or similar, which ensures the product will be promptly re-exported; see Declaration C2. Products imported on a TIB cannot be powered on. All lasers must be declared as being a ‘laser’ upon importation on the shipping paperwork. Failure to declare lasers can lead to seizure and destruction of the equipment, fines or imprisonment (although a more common result is the manufacturer or distributor is simply banned from doing work or making future sales in the U.S.). Start all certification and variance processes early. For products which do not require a variance there can be a delay of up to 3-4 weeks to obtain an Accession Number after submission of a product report to FDA. For products requiring a variance, the delay can take many months. These are currently valid links. FDA sometimes changes webpages, so if a link below is broken, search for the form number or look in the Listing of all FDA forms above. Variance: FDA Form 3147, “Application for a Variance from 21 CFR 1040.11(c) for a Laser Light Show, Display or Device”. Note that this can be filled out just for a device/projector, or just for a laser show/display (e.g., how the device/projector is used), or both. See the ILDA Links and Resources page for additional links, such as to specific FDA documents and forms, and to helpful forms and checklists.